An elderly woman needed help to understand her property sale. Times were tough in the twenties, even so, Fred had a hankering to own his own piece of land, a farm anywhere in Otago. Soon enough, he discovered a newspaper advertisement, a mortgagee sale of a block of land that had all but been abandoned. He like the idea of the river frontage. He never knew the full story, but a dam had been built across the river, and there were the abutments for a water wheel. Someone long ago had built a flourmill there. There were a couple of old sheds, and it appeared that the old flourmill had been pretty much destroyed by fire. He bought the land, a series of river flats that extended to the east to where there was a track down to a ford, which was known as known as Frame’s Crossing. Fred lost his wife to tuberculosis when Maggie was just five, but he kept on working in the boot factory until she had finished her primary education. He bought the land at auction and even though he was the only bidder, it cost him three quarters of his savings. After moving onto the land, Father and daughter stayed in the best of the sheds until he and Maggie built a humble two-roomed cottage, which they would add to as time went on. There was no reticulated water, so it was Maggie’s job to carry it from the river, a steep, slippery climb, but she never complained. There was no electricity, which wasn’t a burden either because no other houses in the district had it yet. The ground was too stoney to dig a pit latrine so they used a kerosene tin for number twos and George emptied it into a little gut some hundred metres from the house. It was a hard life but they got by. Fred picked up work in shearing sheds and on the threshing mills during grain harvest time. He trapped rabbits and sold the skins. Maggie was chief cook and bottle-washer, stretcher of rabbit skins, collector of firewood, she trapped eels, shot paradise ducks and the occasional wood pigeon, which was illegal, but she didn’t know. Fred went into the forest to cut fenceposts and scraped up enough cash to buy wire so he could fence the property and once that was done he bought some sheep. The grass was poor quality but gorse is quite nutritious, when it’s young and soft. To encourage young and soft growth, gorse has to be burnt – it’s the coppice-growth that’s palatable for livestock. The northwest wind brings with it a low humidity and warmer temperatures, especially around the spring and autumn equinox, which is the best time to burning gorse and stimulate new, fresh grown. Old green gorse doesn’t burn cleanly without low humidity and a gentle wind behind it. Moisture in the needles generates dense, brown smoke. Conditions were just right, so Fred went out to burn. But he didn’t come back once the smoke died down! Maggie found him! He was not burnt but somehow became trapped and it was the smoke that got him! Maggie was heartbroken and tried to keep her father’s dream alive, but it was too tough for her on her own, so she moved to the city. Several times, she tried to sell the land, but there were never any takers. By 1960 the Forest Service had stepped up their planting programme and they needed a new headquarters site. They city big-noises wanted to abandon the use of an old farmhouse that was starting to fall down around their ears because they didn’t want to invest in the maintenance of it, despite its beautiful kauri and matai timber. So Maggie was approached and she sold forty acres. The Forest Service plan was to eventually build a forest village on the land, which never eventuated, but the new headquarters was ready for occupation in 1962. 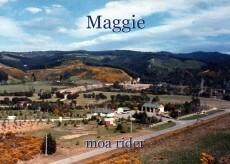 The Forest Service were helpful to Maggie in that they carried out the land survey and erected new rabbit-proof fences, all done honestly and to the letter, but they never took Maggie to see on the ground what she had sold, and what she had left. They provided her with plans and explanations in the office, but she didn’t understand any of it. She wanted to sell the rest of the land, for holiday homes with river frontages, but she really had no clue as to what was her land and what wasn’t. The forestry shiny-bums began to see her as a pest! Henry arrived on the forest in 1965 to run the place while the boss was fighting cancer and was more often in hospital than on deck. Pretty quickly he was briefed about Maggie, and not long after he was told she was on the warpath again, this time asking her Member of Parliament to stir up the forestry people in the city office. Henry heard both sides because Alan the MP, a different MP, asked Henry what he knew about the case. But the shiny-bums in the office were calling Maggie a ‘Nag’. It didn’t seem to be at all onerous to Henry, for someone to help old Maggie, so he offered to locate all the survey pegs, flag them and if Maggie wanted, he was happy to walk around them with her. The dim-witted office people thought that was a good idea, and gave her money for the bus fare! Albert had told him the Maggie was no spring chick, so Henry phoned her on the quiet to tell her he would pick her up at her home in the city. The trip down there was only a bit over an hour. She took a little while to thaw in the truck cab with Henry, but after a while she reminisced about living on the land and the death of her father. Some people have great difficulty understanding maps, and Maggie did, but seeing the layout on the ground and where the pegs were, she understood and was happy with the deal she had made with the Forest Service. They had even surveyed off all of her sections for her, so she wrote in a notebook all the details she thought were important for later reference. Slowly over time she sold all the sections off, poor old soul probably needed the money. Apparently Maggie enjoyed her trip and enjoyed talking about old times beside the river. She even thought that carrying water wasn’t so bad after all. She presented Henry with the money she was given for her bus fare, but Henry told her to keep it in her pocket and say nothing. He never told his bosses that he had picked her up, nor did Maggie, but she did go to the office to thank them for her excellent day. Another excellent slice of life, Moa. Another interesting story, Moa. It is refreshing to find stories like this on Booksie.